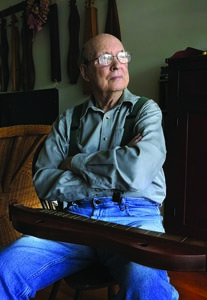 At home in Reston, Va., Ralph Lee Smith ’51 is still making music on his dulcimer. Photo by Laurence Kesterson. After graduating from Swarthmore in 1951 and serving in the Air Force, I moved to New York. In 1957, I rented a one-room apartment at 21 Jones St., in the heart of Greenwich Village for $78 a month. My timing was fortunate. In 1957, Greenwich Village was poised to become the national and world epicenter of the post–World War II folk-music revival. I had played folk music at Swarthmore, and I happily jumped aboard. The burgeoning Greenwich Village folk-music scene included two other Swarthmoreans. Roger Abrahams ’55 lived on Spring Street, in what is now Soho. In 1957, the year I arrived, he helped set up the Café Bizarre, the first of the now-legendary Village folk-singing coffeehouses. He also made field-collecting trips to southern Appalachia. He eventually became a professor of folklore at the University of Pennsylvania. Ralph Rinzler ’56, now deceased, lived on West Third Street, in an apartment that was sometimes occupied by Alan Lomax. Ralph played old-timey and bluegrass music in The Greenbriar Boys, with two non-Swarthmoreans, John Herald and Bob Yellin. In 1970, The Greenbriar Boys journeyed to the Union Grove Old Time Fiddlers’ Convention in North Carolina, entered the string-band contest, and won first place. It was the first Northern urban band to win a Southern competition. Ralph later joined the staff of the Smithsonian Institution and founded the Smithsonian’s Folklife Festival on the Mall. I quickly learned that the folk scene was taking off in Washington Square Park—the symbol and center of the Village. The New York Parks Department had issued a permit for folk music and folk singing on Sunday afternoons, from late spring to early fall. From simple beginnings after World War II, the Washington Square folk-singing afternoons became the nursery of the folk revival. By the time I arrived in the Village, crowds of musicians, listeners, and tourists jammed the fountain area in the park. 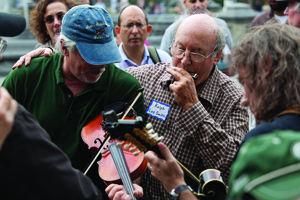 Guitar players, fiddlers, banjo players, mandolin players, washtub-bass players, and washboard players formed impromptu groups, played together, and learned from one another. The musical fare was principally songs from the bluegrass repertoire and older songs from hallowed recordings originally issued by Southern string bands in the ’20s and ’30s and reissued, beginning in the ’50s, by small, highly unprofitable labels run by worshiping devotees. A second venue was a little establishment called the Allan Block Sandal Shop at 171 West Fourth St., a couple of blocks west of Washington Square—a few doors down from Bob Dylan’s first apartment and very near my apartment on Jones Street. Allan drove an American Field Service ambulance in the China-Burma-India Theater in World War II, arrived in New York shortly after the war, slept on the floor of Pete Seeger’s apartment on MacDougal Street, and set himself up as a sandal maker. He was also a classically trained violinist, and in no time he was fiddling old-time tunes with Village string-band players who dropped by his shop. Saturday afternoons became music time in the shop, with Allan alternating cutting and hammering sandals with fiddling. Allan strongly preferred the old-time string-band music, and his shop became the workshop for the rediscovery and renaissance of this highly distinctive music. Sandal Shop players included members of the Greenbriar Boys, Mike Seeger, Tom Paley, and John Cohen, who had formed a group called the New Lost City Ramblers. Members of these groups spent countless hours listening to rare 78-rpm records of old-timey string-band music. Collectors in the New York area unearthed an immense treasure of forgotten American music, which poured out the open doors of the Sandal Shop on summer Saturday afternoons. Listeners jammed the sidewalk and overflowed into the street. I quickly learned two things: first, my simple banjo and guitar-playing skills were no match for what was going on in Washington Square and the Sandal Shop; second, I had an ace up my sleeve. In the late ’50s, there were no harmonica players in the impromptu gatherings at either place. Now, when I was a Depression kid at the Glen Mills, Pa., Public Grade School, 1936–40, I played a Hohner Old Standby, in the key of C, in the schoolyard at recess. We had no one to teach us, and we never heard anyone else play, but we became pretty good! And you know what? You have all heard that the way to get to Carnegie Hall is to practice, practice, practice. It worked for me! On Sept. 22, 1967, I played the harmonica on the stage of a packed Carnegie Hall with The Star-Spangled String Band, an old-timey Village group. We shared the stage with Pete Seeger, Len Chandler, Tim Buckley, and Janis Ian. One of the songs I played was “Arkansas Traveler.” I will never forget it. To the best of my recollection, I never saw or heard of the dulcimer when I was at Swarthmore. We, of course, heard of it in the Village. Jean Ritchie, the great traditional Kentucky folk singer who played the dulcimer, lived just south of Sheridan Square where I heard her sing and play her dulcimer at The Circle in the Square Theatre. In 1957 or 1958, Roger Abrahams returned from a Southern folk-song–collecting trip, bringing with him several homemade banjos with squirrel-skin heads and some dulcimers, all from western North Carolina. He sold them in the Folklore Center for $30. The dulcimers took my breath away! I bought one, taught myself to play, and became the Sandal Shop’s only dulcimer and harmonica player. Ralph plays “Mississippi Sawyer” on his Marine Band harmonica with fiddler Kenny Kosek and mandolin player Gene Tambor at the 6th Annual New York Bluegrass and Old Time Reunion, Washington Square Park, Greenwich Village, September 2010. Photo by Mike Nogami. This event had an important impact on my life. 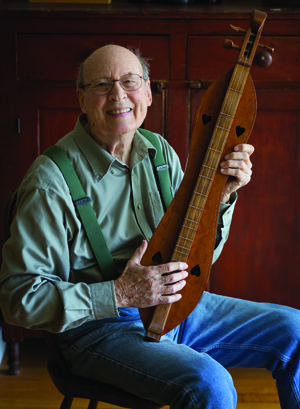 I soon learned that virtually nothing was known about the origins and history of the dulcimer. Beginning in the 1970s, I made several field trips to Appalachia, locating old dulcimers, buying them when I could, comparing their features, and talking to old folks. I then wrote two books, The Story of the Dulcimer (1986) and Appalachian Dulcimer Traditions (1997, second edition, 2010). I believe these were the first histories of the instrument. In 2005, a disabled banjo player named Lou Giampetruzzi sat in his wheelchair in front of his computer and created an Internet group called New York Bluegrass and Old Time (NYBGOT). The only requirement for membership was having played folk music in New York in the ’50s and ’60s—125 people signed up. NYBGOT promptly created an annual reunion in Washington Square, attracting players who were starry-eyed youngsters in the ’50s and ’60s. This year, it will be held Sept. 29, noon to 6 p.m., in Washington Square. Come and hear us sing and play again. We’re as good as ever. Join us afterward at the Caffe Reggio, one of the two surviving MacDougal Street coffeehouses. If you haven’t seen the gleaming 1902 espresso machine, you haven’t lived. To sum up my life in folk music, I didn’t get famous, and I didn’t get rich, but I learned a lot and had a good time! Ralph Lee Smith ’51 lived in the Village until 1971, working as a national-award-winning freelance writer. Until his retirement in 2008 from Connection Newspapers, he served as a communications professional for a variety of organizations. He now lives in Reston, Va., where he is a folk-music historian and performer. What a great time. I regret I was three years too early on jones st.